I am totally with Michael Pollan on the sensuality of having a pot of something aromatic and delicious cooking all day. This is heightened, I think, when the weather is particularly nasty — a huge snow storm or, as today, the push off from Hurricane Matthew. So I took my usual African Peanut Stew recipe and revised it somewhat to accommodate what I had in my fridge. The result is awesome and will have you daydreaming while it slowly stews for hours in the other room. Sirloin Chunks (I am using approximately 1 pound) cut in 1″ cubes, sauteed on high heat in a dutch oven (preferably a cast iron one) in olive oil with two large bay leaves and a teaspoon of salt and fresh ground pepper until the meat is browned. Remove with slotted spoon and set aside. Reduce heat to medium and sautee one onion and some celery stalk, finely diced. A minute or two later add two cloves of smashed minced garlic. To that, after a minute, add fresh roughly chopped ripe tomato and chopped collard greens. After a minute, return the beef & bay leaves to the mix. Add about a quart of water. Cover and simmer for an hour or so. Add Chunky Peanut Butter to thicken sauce (I use the same organic brand I use in my Lucky Like Peanut Butter Dog Biscuits). 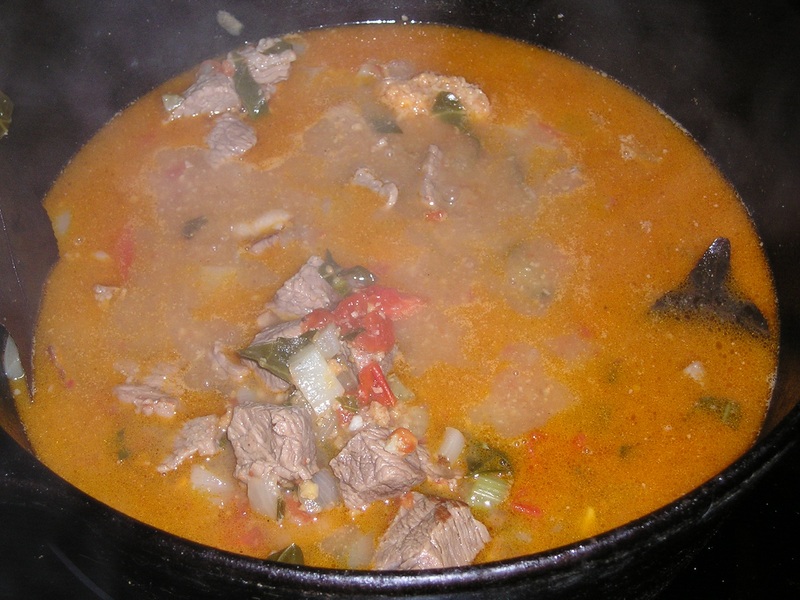 Taste and correct seasoning if necessary, cover and simmer until meat is falling apart. Then it is ready. Enjoy! This entry was posted in Uncategorized by Cherry Gal. Bookmark the permalink.